Trail of Murder are from Bollnas in Sweden - a small town that is already home to a number of bands including Tad Morose and Morgana Lefay. When singer Urban Breed left Tad Morose in 2005 he and former band mate Daniel Olsson formed Trail of Murder. They were joined by Morgana Lefay drummer Pelle Akerlind. The three then wrote and recorded the band's debut album - "Shades of art" before recruiting two new members on guitar and bass to complete the lineup. So first of all, what are they like musically? 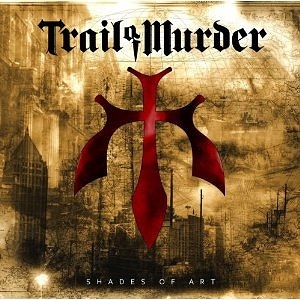 Well think Europe or Kamelot with a load of melodic rock bands thrown into the mix and the result is Trail of Murder - Melodic rock/metal with catchy songs, great hooks and just great to listen to. There aren't any keyboards which is slightly unusual with melodic rock like this, but the music is so strong that keyboards arent needed here - the songs sound just great already and the guitar work is so good that there is more than enough melody here. Opening track "Shades of art" gets things off to a great start - plenty of power from the guitars, a catchy tune and some great vocals - what more can you ask for really? "Carnivore" is one of my favourites on the album - an excellent song with plenty of power and pace. It's one of the heavier numbers on the album, but not significantly so - the whole album treads a nice line never straying too far from the melodic rock/metal territory but equally staying close to the hard rock territory so it gets plenty of power to go with the melody. Final track "My heart still cries" is a ballad, but it's heavier than your typical ballad. It's a great song and like the rest of the album is something you can happily listen to again and again. "Shades of art" is out now on Metal Heaven records.